When it comes to American (or at least American-designed) watches, Xetum is one of the first brands that I recall coming across. 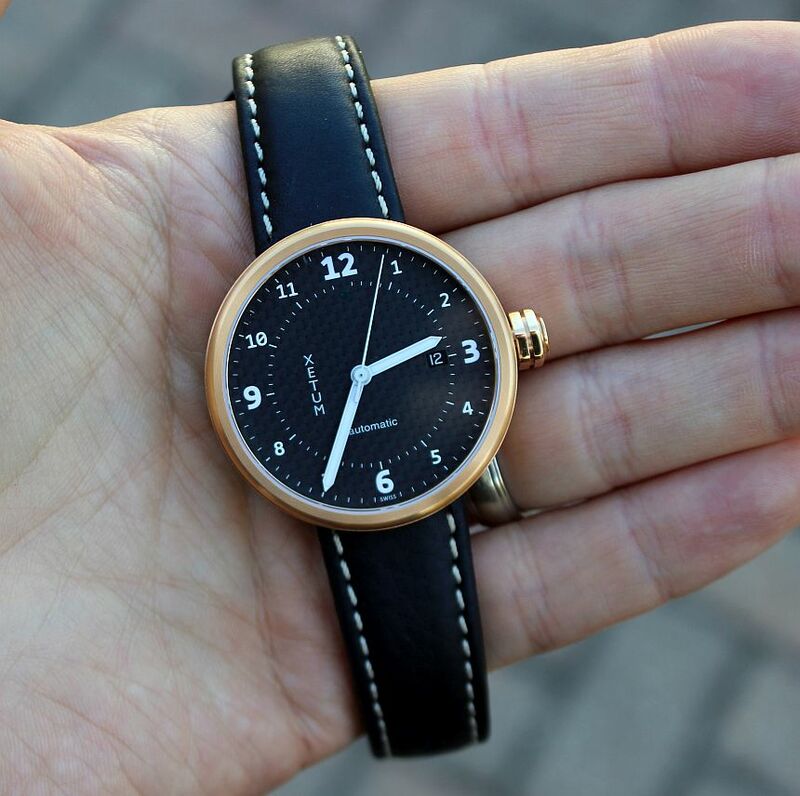 They designed the watches in California, and then had them built in Switzerland. So, you had that Swiss reliability and accuracy, with a sort of American influence on the design. Xetum is now owned by the same folks that own Torgoen, but the designs have not been meddled with. Today, we are going hands-on with a new iteration of the Xetum Stinson. 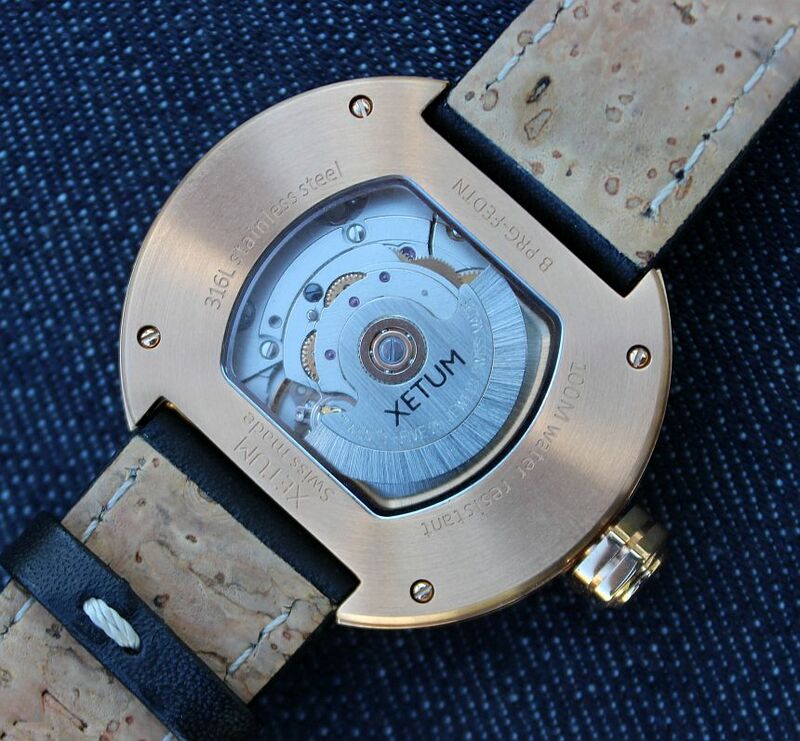 As I mentioned at the outset, the Xetum Stinson is largely unchanged from the earlier versions we have seen – the stainless steel 40mm case still measures in at 11mm tall, and strap fits in to integrated, or hidden, lugs on the underside of the case. 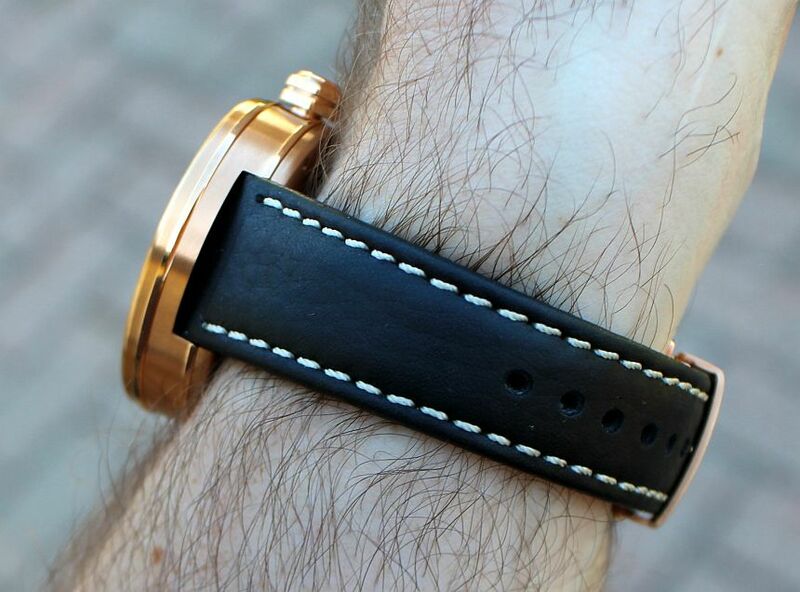 This of course makes for a snug fit to the wrist, as well as making for a very prominent stand-off from your wrist. This is more a question of your preferences, as in all practicality, there is no issue with fitting the watch under a cuff. 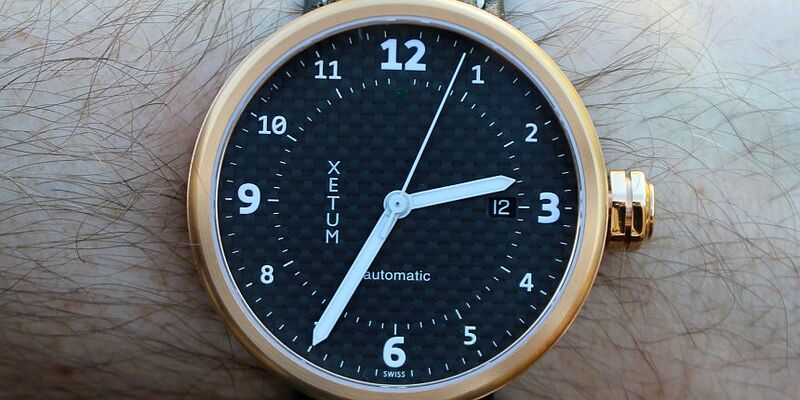 Also unchanged from prior Xetum Stinson models is the movement; in this case, an ETA 2824-2. Through the exhibition caseback you can see the signed rotor, and your eye will also note that the movement is a good fit to the case. Sure, there is some extra space there on the sides, but it fills things in nicely. Being a bit smaller also means that the date window is positioned such that it does not cut off any numerals or indices, which I rather like. This then gets us to the subject of what is different on this model. The dial is one big area, being as we have carbon fiber being used here. On watches that have used CF on the dial, as this Xetum Stinson does, it makes for a rather lovely effect. First, you have the added visual dimensionality that the weave provides. Second, due to the clear layer that much be on top of the CF, it makes it look as if anything printed on the dial is actually floating. This is hard to describe and tougher yet to photograph, and is something you should strive to see in person at some point, as it is rather unlike any other printed dial you have seen (short of a translucent one). 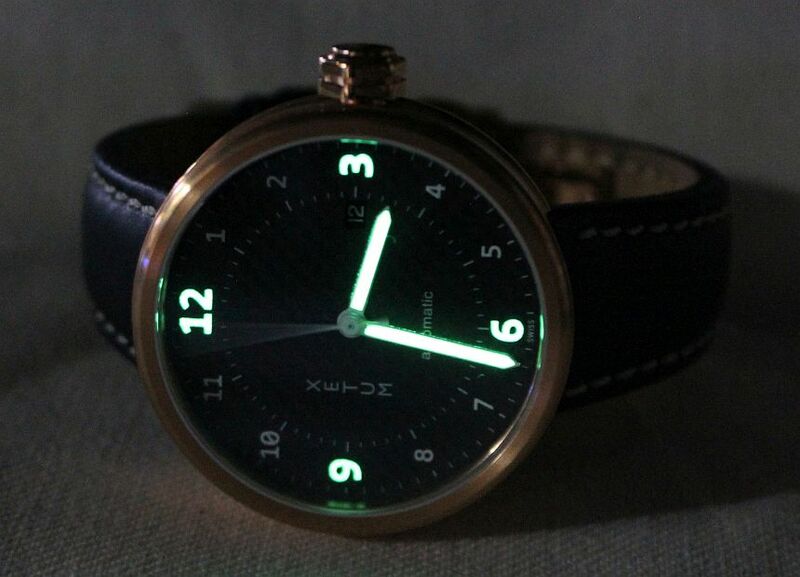 The numerals and handset stand out quite sharply against the dial, be it day or night. 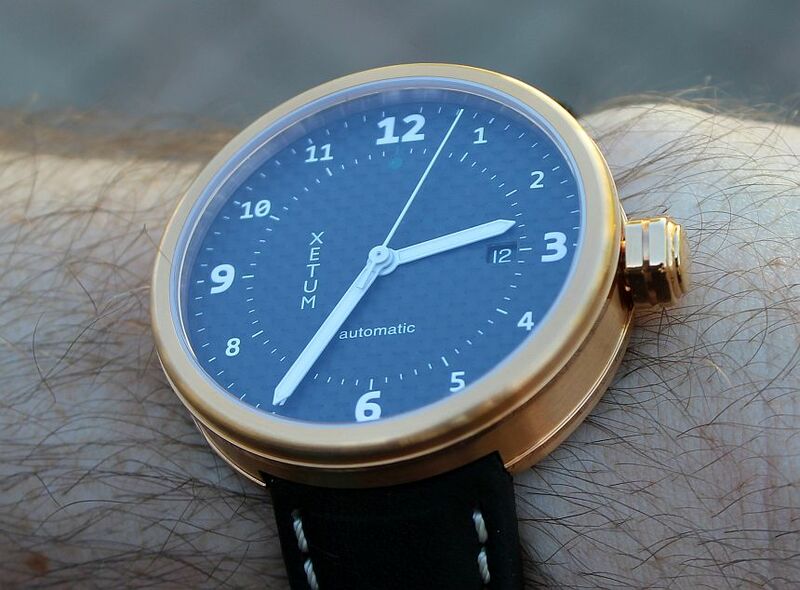 The other big change is the rose gold PVD finish on the case (truly gold, not a gold tone). We have seen both finished steel and black PVD finishes from Xetum before, but this is the first time one with a rose gold finish has crossed my desk. This seems to have been a more popular choice as of late (again, based on what I’ve had in), and I tend to like it. 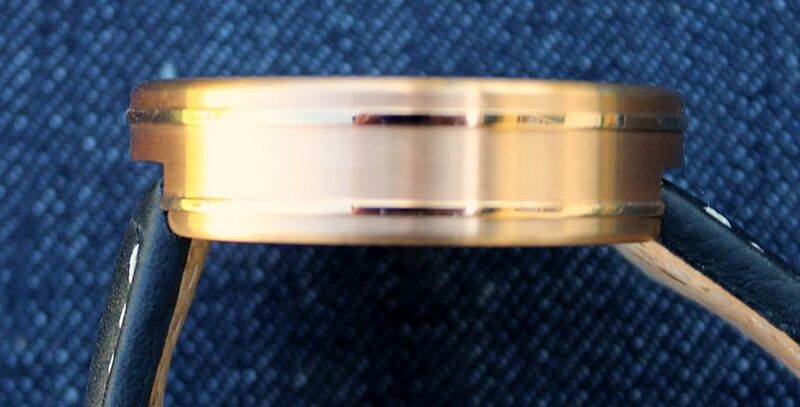 While yellow gold does not fit with my own personal tastes and style, rose gold is a nice middle ground. It gives you that look (or sense) of a luxurious material, while giving things a fresher tone. While some brands do have a much more reddish (or coppery) look to them, on the Xetum Stinson it’s more along the lines of a muted down yellow gold, or perhaps a lightened tone from what you see on a new penny. Not quite a “rose” as I might prefer, but it is still a good look. This is presented primarily in a brushed finish (as is the signed buckle), with high polish showing up on two ribs encircling the case, as well as the hex crown. I tend to prefer brushed finishes as they do not readily show fingerprints. However, the inclusion of some polished accents gives things a dressier feel. As to the crown, the hex design is another thing that sets the Xetum Stinson apart, and makes for a easily-gripped crown, be it unscrewing it from the case, winding the movement, or setting the time. It may just a bit far out from the side of the case for some tastes, but I did not experience any issues with it digging in to my wrist. 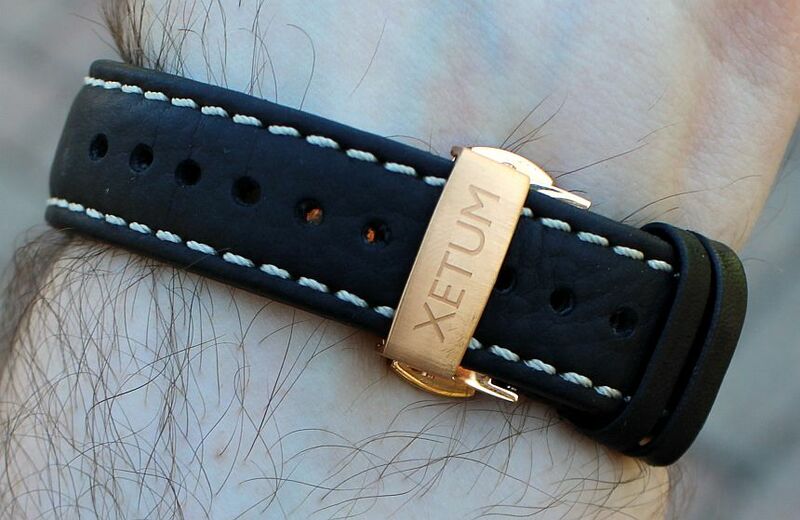 Speaking of my wrist, it is worth noting some things on the strap. 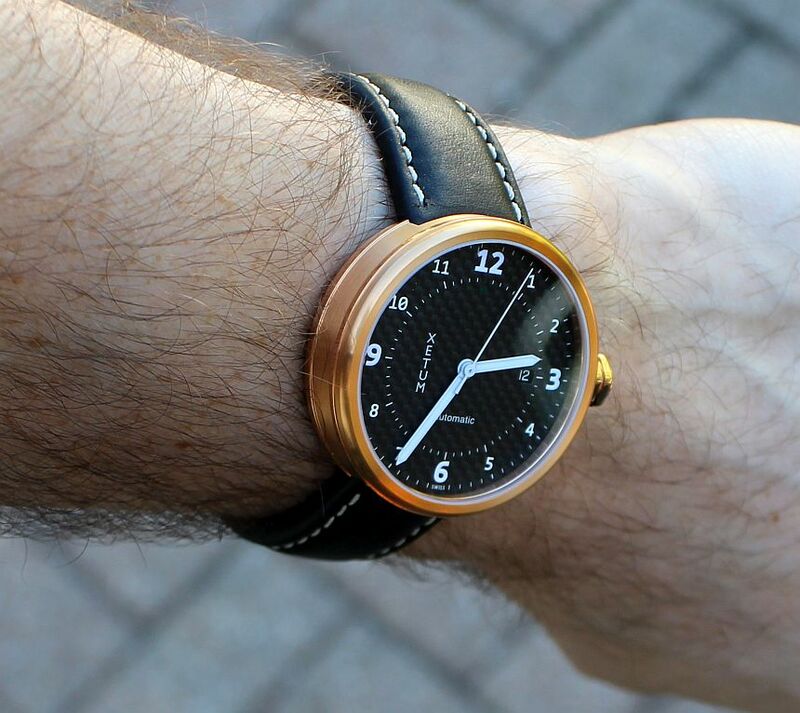 First, the finish on the leather strap is quite soft – both in terms of flexibility, as well as to the touch. It has an almost sueded feel to it (without actually being suede), and that gives it a rather nice feel. Second, the back of the strap is lined with cork (as we have seen before from the brand). While providing a smooth (and natural) finish against your skin, it also has the added benefit that it will absorb sweat that you might generate during the day, which also helps with the comfort. If you swim with it (the watch has a 100m WR rating), then I do not quite know how that would work out (feel free to let us know in the comments if you have done this), but once things dry out, then you should be ready to go. Would I wear it? : Yes. Then again, this one has gone on to John’s collection, so he’ll be the one sporting it. What I’d change: On this specific model, I would like to see a redder tone of rose gold used. Past that, let’s bring out some new designs! 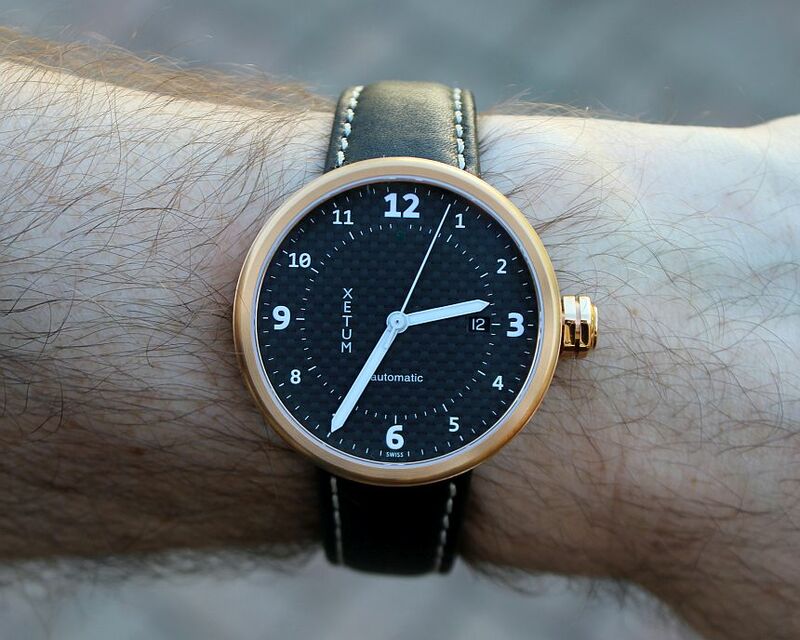 Strap: Black leather strap with Italian cork lining.